What’s the most dangerous creature on earth? Without question the answer is The Mosquito. Mosquitoes and the diseases they spread have been responsible for killing more people than all the wars in history. There are over 175 species in the U.S. and the most common, and most dangerous, are the various species in the Culex, Anopheles, and Aedes genera. Aedes is a genus of mosquito originally found in tropical and subtropical zones, but now found on all continents excluding Antarctica. The genus contains over 700 species; the most medically significant of them being Aedes vexans, Aedes albopictus and Aedes aegypti. Aedes species typically bite at dawn and dusk. Aedes Vexans is found in every state in the U.S. including Alaska and Hawaii. The species has a distribution in the continental USA that extends from southern Florida to Quebec, on the east coast, and from southern California to Alaska in the west. Aedes vexans is recognized as New Jersey’s most serious pest mosquito due to its abundance, widespread distribution and breeding potential in floodwater habitats. They are described as West Nile virus bridge vectors; meaning they can transmit the virus from the bird population to humans. During the day they will feed in shady areas, but are most active at dusk. Breeding sites include artificial containers, storm sewers, drainage ditches, marshes, streams, and a variety of other sites. The adults are known to fly great distances and are readily attracted to light. Aedes albopictus, or Asian tiger mosquito, is currently the most invasive mosquito in the world. Introduced into the U.S. in the mid-80s through a shipment of used tires, it has now spread to more than 900 counties in 26 states in the continental USA, as well as Hawaii. It is of medical importance due to its aggressive and persistent daytime human-biting behavior and ability to vector many diseases, including Dengue, La Crosse, Chikungunya and West Nile virus. Aedes albopictus is an opportunistic biter, which will bite as often during broad daylight as it will at dusk. It has a preference for humans over animals, typically approaching at ankle level and working its way up the body. During the day it can be found in shady areas where it rests in shrubs near the ground. 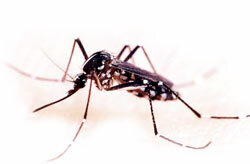 The Asian Tiger Mosquito is more aggressive than the Yellow Fever mosquito and has a bite that results in considerably more irritation. Aedes aegypti or Yellow fever mosquito is the primary vector of Dengue, Chikungunya, Zika virus and Yellow Fever. Aedes aegypti is an aggressive daytime biter - most active during daylight and for approximately two hours after sunrise and several hours before sunset. An indoor/outdoor pest, the mosquito will happily rest inside closets, under chairs and other dark places. Outside, they rest where it is cool and shaded. Highly resilient and difficult to control, Aedes aegypti is extremely adaptable and past efforts to eradicate this species from the U.S have failed. Their eggs can withstand desiccation (drying out) surviving in containers without water for several months. Egg hatching subsequently occurs following rainfall or the addition of water to those containers harboring eggs. Culex mosquitoes are painful and persistent biters. They prefer to attack at dusk and after dark, and readily enter dwellings for blood meals. They are generally weak fliers and do not move far from home. Culex pipiens, also known as the northern house mosquito, is the most widely distributed mosquito in the world and is found on every continent except Antarctica. They breed in a variety of water containers, don’t travel far from their breeding sites and are often found around the home. They are known vectors of West Nile virus (WNV), Eastern and Western Equine Encephalitis and Heart-worm in dogs. Most active at night, Culex pipiensprefer to attack at dusk and after dark. Culex tarsalis is the most important mosquito vector of arboviruses in western North America, responsible for the transmission of St. Louis and Western Equine Encephalitis viruses. Culex tarsalis inhabits large tracts of territory between northern Mexico and southern Canada, spreading from the Pacific to the Atlantic coast. It is most commonly seen in California, at elevations ranging as high as 3000 meters.Culex tarsalis is most active in the few hours after sunset feeding on both bird and mammal hosts. These mosquitoes find hosts by detecting the sweat and carbon dioxide exhaled by mammals or birds. During the daytime, adults can be found resting in shaded areas such as tree cavities and animal burrows. Culex restuans is considered a vector of St. Louis Encephalitis (SLE) and West Nile Virus (WNV). They will breed in water that ranges from clear to grossly polluted and are found in a wide variety of aquatic habitats including ditches, streams, woodland pools as well as artificial containers. While some experts consider the mosquito to be a bird feeder that rarely, if ever, bites humans, others have described the species as a significant pest with an annoying bite. Anopheles quadrimaculatus is the chief carrier of malaria in the eastern, central and southern U.S. While Culex mosquitoes can breed and thrive in stagnant or polluted water, the Anopheles mosquitoes prefer to lay eggs in permanent pools of water with vegetation, such as ponds, lakes and swamps. Active principally at night, they are vicious biters who prefer large mammals and humans, and attack after dusk. Anopheles freeborni the Western malaria mosquito, is found in western Canada and in the United States. This species is the principal malaria vector in the arid and semiarid western U.S. (Carpenter and LaCasse 1955). They are more active at dusk and during the night but occasionally do attack man during the daylight hours in dense shade or on cloudy days. Ochlerotatus mosquitoes are among the first groups of mosquitoes to appear each season. They are painful and persistent biters, attacking during daylight hours (not at night). They do not enter dwellings, and they prefer to bite mammals like humans. Ochlerotatus mosquitoes are strong fliers and are known to fly many miles from their breeding sources. Ochlerotatus triseriatus; known as the Eastern Tree Hole mosquito, is one of 36 known species that can transmit the West Nile virus and is the primary vector of La Crosse Encephalitis virus. In the U.S. it is widely distributed east of the Rocky Mountains and inhabits all of the Southeastern States. This species is typically considered a troublesome biter in wooded areas and will readily attack humans anytime of the day. Ochlerotatus canadensis; common in late spring and summer this fierce biter prefers humans and other mammals. Larvae are abundant in late spring and found occasionally during the summer in woodland pools, swamp borders and grassy hummock areas. This long-lived mosquito is the primary suspect in the transmission of heartworm to dogs and a possible suspect in the transmission of EEEV from birds to humans. Culiseta mosquitoes are moderately aggressive biters, attacking in the evening hours or in shade during the day. In summer, the most common breeding area for these mosquitoes is backyard fishponds. Culiseta melanura favors acid water and is normally found in acid bogs with a pH of 5.0 or lower. Two primary habitats for this species are found in New Jersey. Culiseta melanura is a mosquito species that is not attracted to mammals and feeds almost entirely on birds. The mosquito is responsible for maintaining EEEV in bird populations and plays a significant vector role in that regard. Culiseta melanura initiates the infection in bird populations; other mosquito vectors (i.e. Coquillettidia perturbans) is responsible for equine and human cases. A genus of large, mostly yellow, viciously biting, fresh-water mosquitoes. Coquillettidia perturbans is a vector for Eastern Equine Encephalitis (EEEV) in North America. It is a night biter but will bite in the shade during the day if disturbed. A strong flier, it will fly several kilometers in search of a host. This species is found more commonly in the eastern and southern states, but is also present in small numbers in the Great Plains, Rocky Mountain States and along the Pacific coast.